As I advised you in my earlier letter, I have my diagnosis of a type of dementia, which is killing off my brain cells until its wrathful journey ends all of my brain functioning. It is taking my world away. I will not allow my family to view me this way. My mother died with an illness that gave her physical unbearable suffering due to her broken fragile bones, her shoulders and ribs that would not mend Her every day was spent in tears, screams for help and pleas to end her suffering. Our memories are still raw in sadness with what we had to share/endure with her. My respected Neurologist states: “once I am in that demented state ‘YOU won’t know – what you are doing etc.” However my family, spouse, children and grandchildren will share this horror perhaps for their remaining lives. I would ask you Senator Burston, to visit a bed ridden dementia ward (we, my sister and I, called it death row). During your visit (unannounced) I would ask you to put yourself in the place of one of these people there. Would you prefer to live out your existing years like that? Or visit your wife/family or anyone that you love, in those circumstances? Please accept and agree this is a cruel and barbaric existence that YOU have determined by your vote they have to endure. When I, and my husband with my children, accept that my brain ability has deteriorated so that it no longer functions, I/we will be forced to leave Australia for Dignitas Switzerland, to “end my life there compassionately”. Costly -and emotionally traumatic for myself and husband and for my children. I/we and my family will “NEVER” put me into one of those end of life nursing facilities. 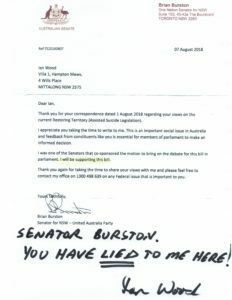 Senator Burston, your written words of promise – to vote towards changing the end of life laws – to give people the right to” die with dignity”- could have given me a quality of life to freely enjoy peace of mind, to be able to focus only on seizing every possible day, until my health ceases to allow me to do so. Then allow me and others a rightful humane gift of ending our lives when all hope has gone. You, Senator, who appeared to have a human conscience, have betrayed us!